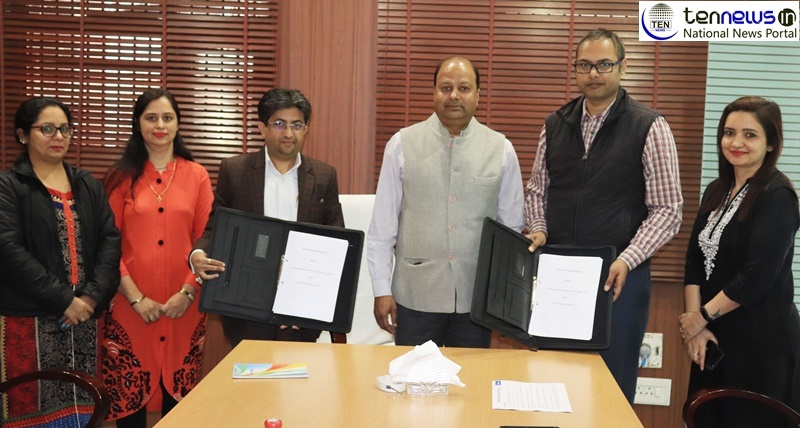 India, (5/12/2018): With the aim to advance cooperation in the areas of internships, professional training, joint research, and other academic-related endeavors, J.C. Bose (erstwhile YMCA) University of Science and Technology, YMCA, Faridabad, has signed a memorandum of understanding (MoU) with the Amber Enterprises India Ltd – a prominent solution provider for Air conditioner OEM/ODM Industry in India. The MoU was signed by Dr. Vikram Singh, Dean (Academics Affairs) on behalf of the J.C. Bose University and Mr. Sanjeet Kumar, General Manager, Amber Enterprises signed the MoU on behalf of Amber Enterprises. Director, Industry Relations Dr. Rashmi Popli, coordinator Ms. Jyotsna and, Mr. Chitarth, Team Lead, Innovation Team from Amber Enterprises were also present on this occasion. Speaking on this occasion, Vice Chancellor Prof. Dinesh Kumar said that Industry collaboration of such kind helps the students in their transition from the University to the real world of work. He hoped that this academic partnership with Amber Enterprises will contribute to the University’s aim of providing relevant, innovative, and quality education that produces leaders who can contribute to the socio-economic development of the Country.